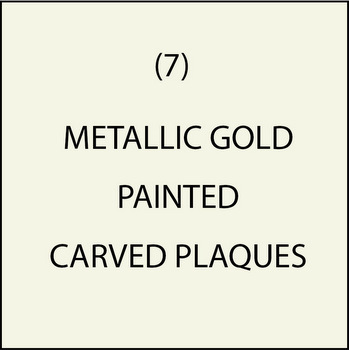 This section shows our metallic gold painted signs & plaques. We use the best metallic gold paint available. We use Matthews two-part acrylic polyurethane paint (MAP) gold paint. We also use 1-Shot gold enamel for letters and some artwork. You can compare our gold painted plaques with our gold-leaf gilded plaques in Section B.(5). Because paint has lower reflectivity than pure 24K gold, painted gold signs look best under fairly bright lights. In low light conditions, gold-painted plaques tend to look slightly brown. We often combine gold painted areas with gold-leaf gilded areas on the same sign or plaque. The gilding is done on text, artwork, and borders, and the backgrounds are painted metallic gold. This reduces the cost of the sign or plaque, since we only charge extra for the area actually gilded. The large plaque M7325 in this Gallery has both gilded (bright) and painted areas (darker). To get prices for these or similar plaques at any size please call 951-698-8484 or email us at info@artsignworks.com.